Percy was a tiny cub when he was rescued with his sister Nancy and brother Bob – the last animals to ever appear in a Bolivian circus. For three weeks the circus had eluded ADI in a remote mountainous region, then finally we were able to swoop in to seize them in the searing heat in Monteagudo. Circus workers would surround his mother and drive her apart from her cubs with iron bars, and then drag the cubs out through the feeding hatch. People in local parks would be charged for photos with them. Today, Percy, Nancy, Bob, mum Kiara, dad Hercules and older sisters Panchula and Fida roam in almost 20 acres at The Wild Animal Sanctuary. In summer it is like African savannah and later it becomes a winter wonderland for the lions as they run and play in the crisp Colorado snow. When the lions first arrived, a special heated biosphere was built to help them acclimate, and this is now used for other rescued big cats. Today, they are stronger, fitter and their coats full and luxurious. Just look at Percy now (left)! With a proper diet and exercise he is even bigger than dad Hercules. Sadly for some of these animals, the circus has already stolen the best years of their lives, so we can only give them the longest, happiest retirement possible. But for Percy, Bob, Nancy and indeed the other young lions like Fida, Panchula, Rosa, Rosita, Rosario, Campeon, Marta and Maria, they have almost their entire lives ahead of them. They will be free for, possibly, 20 years. A symbol of freedom. This is a major long term commitment for their future. Please help us care for them for life by adopting Percy for $36 or, all three cubs for $60. 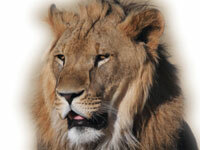 Click here to adopt one or more ADI rescued animals.